Cockroaches are the most common insects that you will spot in your home and around your neighborhood. These winged creatures are very active, and they reside almost everywhere, especially in areas that are prone to moisture and garbage. You might have noticed they these creatures are quite active during the night hours; however, have you noticed that they always roll over to their backs at the time of death? Why does this happen? Is there any scientific fact behind this behavior of cockroaches? Read on to know the answers to these questions. Heavy bodies: The body of a cockroach is quite heavy. The three segments (head, thorax, and abdomen) are very bulky in a cockroach. The whole weight of one’s body is supported by one’s legs. In the case of cockroaches, the physical setup is a little weird. The insect has only six very slender legs to support its heavy body. Therefore, when they die, they lose control of their balance, and their legs don’t have enough support to hold them strongly. This is the reason the insect immediately rolls on its back at the time of dying. The answer to this question is “mostly.” In most of the cases, cockroaches do die with their belly facing upwards and on their backs, regardless of natural death or when sprayed with insecticides. What is your first reaction when you spot a cockroach in your kitchen? You immediately grab an insecticide and spray on it. As soon as the insect is exposed to the chemicals from the spray, it struggles for its life before eventually rolling on its back to die. You are directly attacking the nervous system of the cockroach when you spray insecticide on it. The sudden shock from the chemicals causes muscle spasms in the insect. Since its body is already very heavy, the cockroach cannot help but die on its back. It isn’t able to get a proper grip because the muscles in its slender legs contract and get tucked underneath their heavy bodies at the time of death. When it struggles from the effect of the insecticide, the cockroach tries hard to get back to its original position after toppling on the floor. However, since most of the homes have tiles and smooth floors, the insect isn’t able to get a hold on itself and thus dies on its back, after trying very hard in vain. 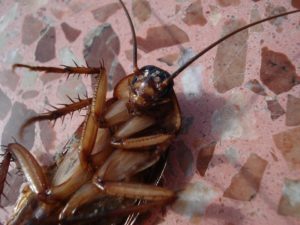 When you see a cockroach lying on its back in your house, don’t assume it to be dead. These clever creatures can play dead just to tease you. When you try to throw it away with a stick or broom, they immediately latch on the items for support to get back to their original position. An interesting point to note is that cockroaches that live in the wild do not die on their backs. Since they live on uneven grounds, they have enough support in the form of twigs, leaves, branches, and mud to get them back to their original position. Though their heavy body is supported by very thin legs, they still take the support of the hard ground to get a good grip on their position, in this case.